Once I heard that Brazen Racing was helping (taking up?) host the 45th annual Double Dipsea I signed up immediately. If you are not from the greater San Francisco Bay Area you might not know about Brazen but they are amoung a handful of experienced trail race hosting companies known for high volunteer to runner ratios, well stocked Aid Stations (AS), finisher tables and good vibes! 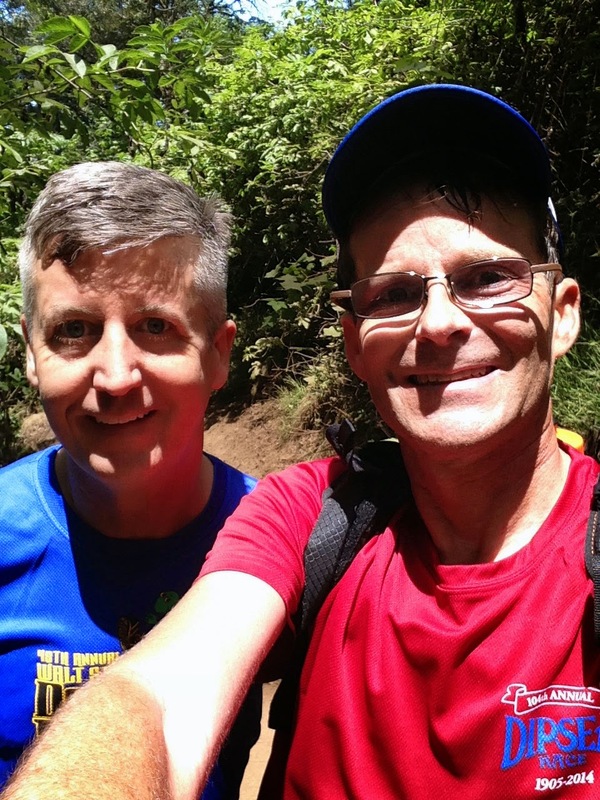 I previously commented about running The Dipsea and training for the Double Dipsea. Now it was obviously time to put all that training and experience to work for the actual race...right? Well not exactly. Sometimes life throws you lemons and you have to attempt to make lemonade. Here is my tale of lemonade making. Unbeknownst to me, I had actually sprained my ankle and strained my Soleus muscle while running The Dipsea two weeks before on June 8th. 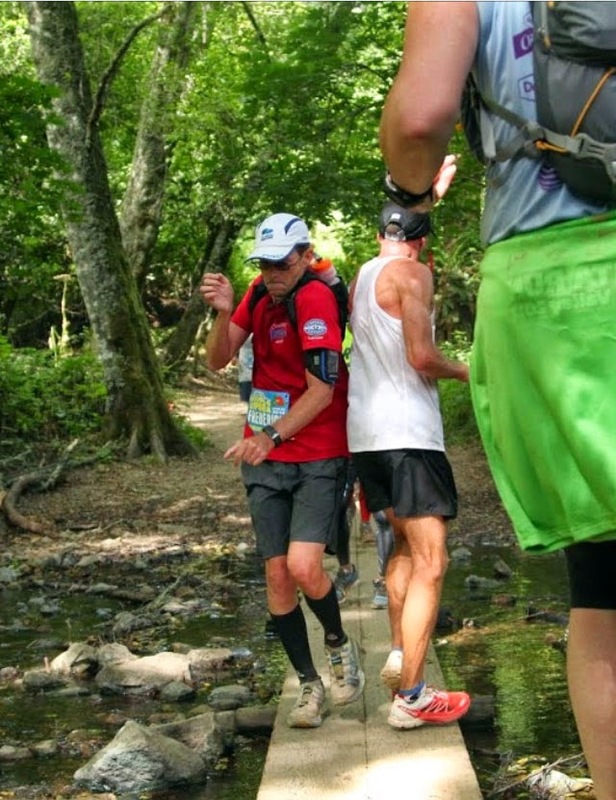 I actually don't remember doing it but then again when running such a technical race most of your attention is focused on not tripping on obstacles like uneven stone steps, rocks, ruts, pine cones, branches or tree roots. But, I sure as heck did. Two days after the first Dipsea race (Tuesday) I was able to go for a short six mile trail run although at a much slower than normal pace. However, by the fourth day (Thursday) I could walk but running was out of the question. I attempted to go on my normal 10 mile run and only made it two miles before circling back. [It takes alot of pain and discomfort for me to admit I can't run and turn back] For the next four days straight I iced, took Ibuporfen, swam, rode my mountain bike and massaged. I felt slightly better on the trail run the following Tuesday and at least I wasn't sore but still slow. I almost didn't run the Double but I knew many people who were running it and believed you can run almost anything if you back off on your pace, watch your form and minimize jarring motions. So come race day I used KT tape to control both ankles and set out to enjoy every minute of the day. My friend Steve and I decided to carpool and leave early since parking was thought to be limited. Our respective race waves would start around 8:50AM so given 1.5 hour drive we left at 6AM. We arrived before 7:30AM and found plenty of parking not far from the beach and a small grouping of porta-potties (named Honey Pots?). The line for the Honey Pots was a little long to start with then got progressively longer as you would imagine. I think there were roughly ~16? We all got by. On the way to pick up our bibs we met many familiar faces : Tony Nguyen (Endorphin Guy) helping out by doing bib searches and many others. 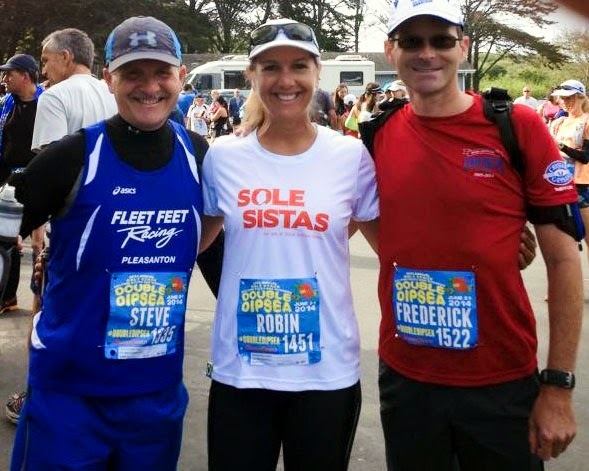 Here is picture of fellow P-town runners (Steve, Robin, Self) moments before Robin's wave started out. Brazen's results page indicates that 662 finished the race as runners, and 72 as hikers or 734 total. [Oldest was 82, youngest was 14!] Luckily we didn't all start at the same time with roughly a new wave every 3 minutes or so but it sure felt crowded on the single track. Here is a representative picture crossing a small stream almost to the Muir Woods parking lot. Yes it probably would have been much smarter to have simply ran through the stream because it wasn't much of a stream at all. But that would have not made for a good shot now would it? Since I purposely was power walking most of the course I started catching return runners at Muir Woods and it got progressively more crowded as I made my way to the three famous sets of stairs leading down to Mill Park. It is hard to put into woods the relief you get when you finally make it down all the stairs to the turn around point then it really hits you that you have to now climb all the way back up! I seriously thought about just sitting down on a park bench and watching the kids play on the jungle gym (as did a number of other lingerers). But no, total time at the turn around was probably a mere minute or too then back I went. Another moment I actually thought about just sitting down was near the hill called Insult. Why? Mentally, when you make it half way back you are thinking I'm half way which means I crested the top of a mountain so I should be running DOWN from here on end. Nooo! At about mile 12.5 you encounter yet another steep incline that you really don't feel like climbing at all. I met a fellow Kaiser Permanente staff member also probably having similar thoughts. The final miles AFTER Insult are quiet enjoyable with breathtaking views of the coast, wider sandy trail winding back and the feeling that the End is Near - the good one. 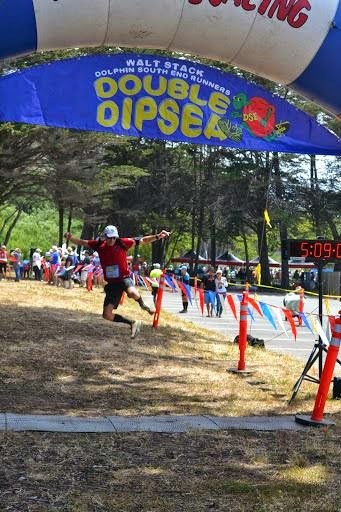 I saved just enough energy for TWO heel clicks (one right then left) that finished the Double Dipsea race for me. Post race more mingling with other survivors, trip to the market for some BEER and food. 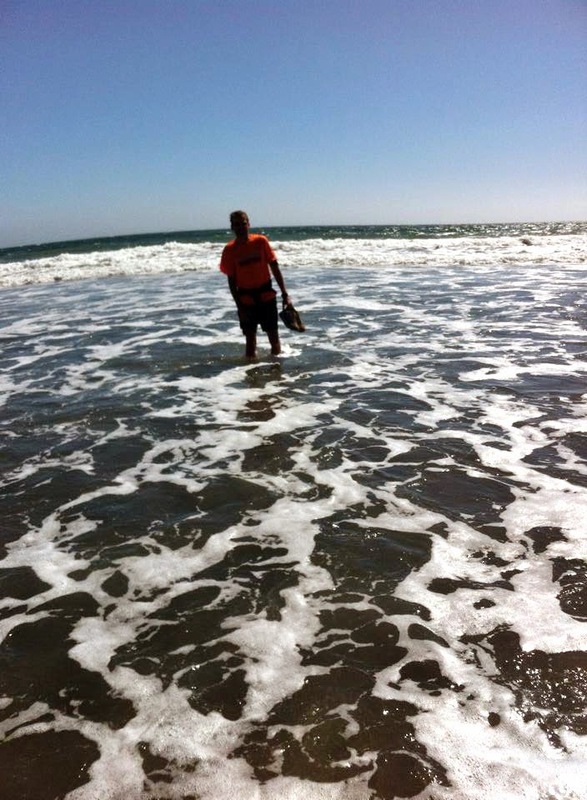 We couldn't leave the beach without spending a few moments in the refreshing cold water. It really did feel great on tired calves! This was by far the SLOWest half marathon I have ever hiked/crawled and shuffled along to complete. I did the training run in 3:22 and it took me 4:17 hours on race day! Realistically I was lucky to even have raced it given my problems with ankle and soleus. In the end it was the epic adventure with old and new friends that I will remember for years to come. PS I finished slightly nauseous which was odd because I consumed all the normal food I would eat on race day. I drank two 23 oz bottles of Roctane plus cups of coke or poweraid at some of the AS so I don't think it was from dehydration. It was also not very hot in fact the weather was between 65 and 75 - OK. Hmm, another mystery to figure out.